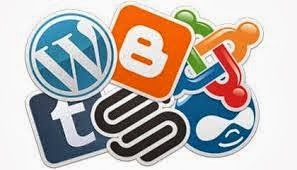 Have you ever thought of owning a website or a blog? Perhaps you are inspired by popular bloggers and site owners like +Linda Ikeji and Huffington post but you don’t know where to start from. Well, today is your lucky day. This article gives you a step by step approach on how you can get started and make it big in the blogosphere. Log on to a website like wordpress, blogger or tumblr and create a free blog. Usually, when you create a free blog, it comes with an extension e.g. if your blogs name is abc health , it comes as abchealth.blogspot.com. However, to buy the domain name, you have to pay a fee which is usually minimal. Get a good and attractive layout. Make sure that the layout of your site is attractive and directly relates to what your site is and stands for. Here, you have to consider what images you use and the colours you choose as they have to project the overall ambience of your site. Get a domain name. This might be a repetition but just goes to show how mighty important it is. Examples of domain names are .com, .net, .org and many more. However the choice of a domain name depends on the type of site you intend running. For example, most sites are registered with .com, while corporate organizations use .org. however there is no hard and fast rule to this as its solely on the discretion of the blog owner. Publicize. Nowadays, there are so many ways to advertise your site. You might decide to paste updates on your Facebook wall regularly, or twitter. Alternatively, you may choose to create a specialized Facebook page for your blog, as well as a twitter handle. Then you can promote your posts for a minimal fee on Facebook. Make sure however that you study the advert planss thoroughly before subscribing to any so as to ensure maximum reach. Another veritable source of advert publicity is google ads. These are highly targeted ads with a wide reach. Other forms of publicity that cost nothing include being a guest writer on other popular sites e.g. nairaland. Make sure you include your site address at the bottom of any of your posts, but exercise moderationn when doing this so you are not labeled a spammer. You might also consider putting your ads in local newspapers and bulletins. Update your blog regularly with relevant information in your niche. This will ensure that your readers are kept captivated and they don’t lose interest in your site. If you are going to be away for some time, you may consider getting someone to help you out in updating your site regularly. Check your site regularly, at least once a week. Is very easy to get discouraged and forget about your blog, but if you keep on working at it, your blog will definitely be a success. Information is away of this planet, I would force to discern again from your journalists.